This post was done in partnership with Eddie V's, who provided me with food and drinks, free of charge. 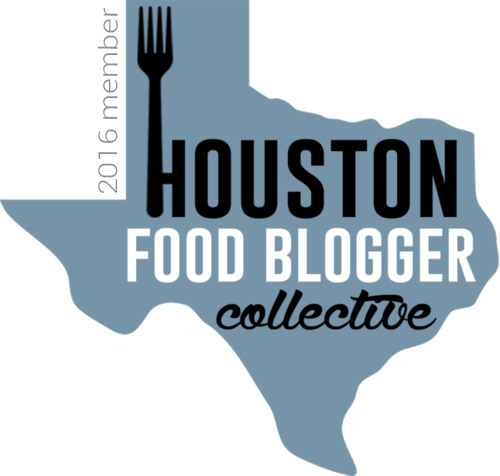 I was not monetarily compensated for writing this Houston restaurant review. All opinions are completely, 100% my own! Sometimes you just need a date with your mom. 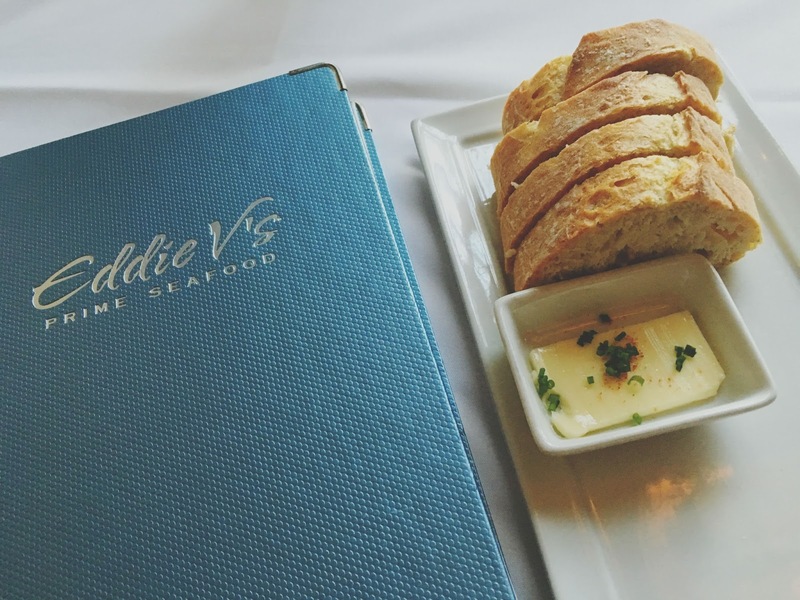 This past Monday my mother and I went to the Eddie V's in Houston's Upper Kirby West Ave complex, and we were on a mission to sample food and drink items from the restaurant's Sparkling Sounds of Summer menu, new Eddie's Hours menu, and main menu. 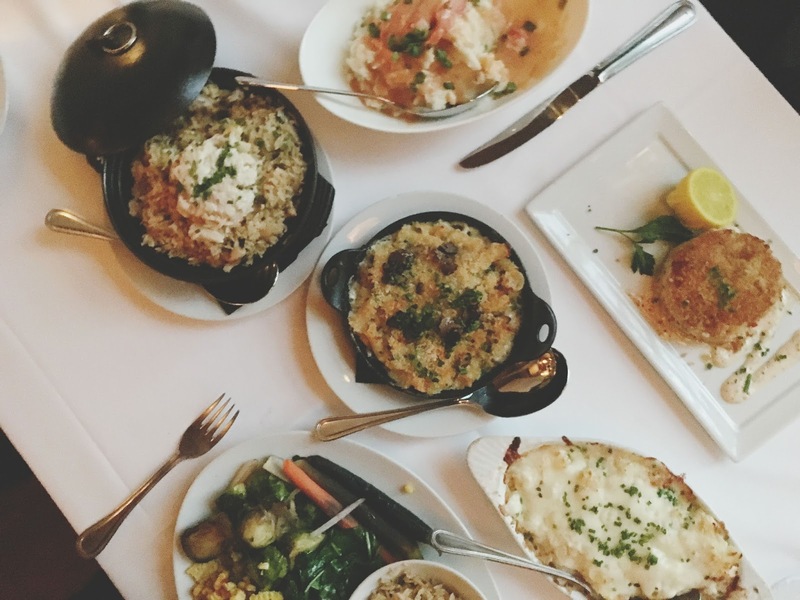 Through August 28, the restaurant is celebrating the Sparkling Sounds of Summer with live iconic music genres - including Jazz, R&B, and American Standards - paired with a sparkling and shareable Lounge menu. Seated in the restaurant's beautiful lounge area, my mom and I totally dug the jazzy standards coming from the live band nearby! First we were presented with some complementary bread and butter. The fresh bread was dense and spongy, and the butter was wonderfully soft and herby. Because Eddie's Hours (aka Happy Hour for all you day drinkers out there aka me) were ending soon at 7 pm, we both started with a cocktail from that menu. I ordered "The Perfect Martini" (I mean, how could I not. ), and my mom went with the restaurant's "Bulleit Sour." For those of you who have spent any iota of a second reading my blog (and thank you! ), you probably are attuned to the fact that I love martinis with a fiery passion to the moon and back and insert any additional cliche lovesick phrases here. LOVE them. And y'all? I loved this one! I asked to have vodka in my classically prepared martini (though I do love gin as well), and it was stiff, ever so slightly dirty, and garnished with blue cheese stuffed olives, which duh is a total game changer. It was a fantastic martini, and I know it was made with the finest of vodkas because the drink went down entirely too smoothly! My mother's drink was a concoction of Bulleit bourbon, honey, and fresh lemon and lime sour mix. Hers was suuuuper boozy, not overly sweet, and soul-warming, and it came garnished with drunken cherries, um hello, also a gamechanger. This was also a great choice! 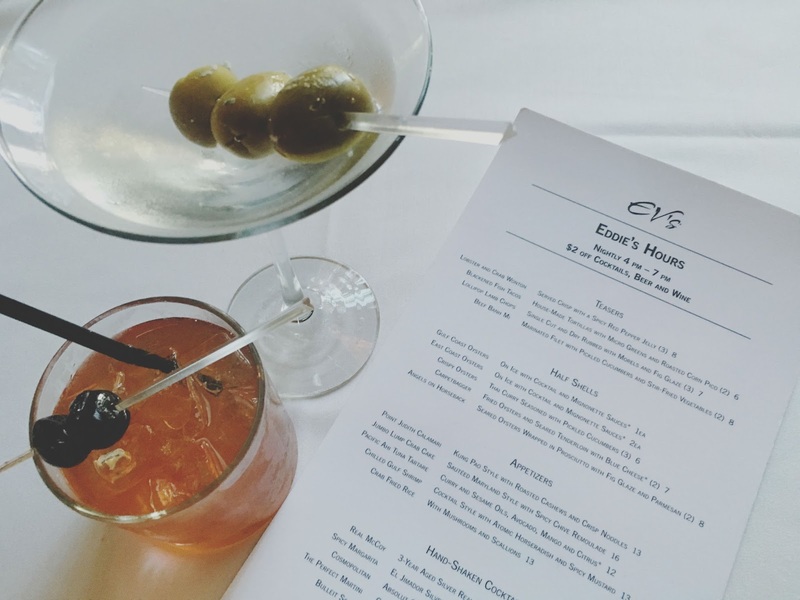 For our first round (of about 70 rounds total) of food, my mom ordered three east coast oysters from the Eddie's Hours menu, and I chose the heirloom tomato tartare from the Sparkling Sounds of Summer menu. 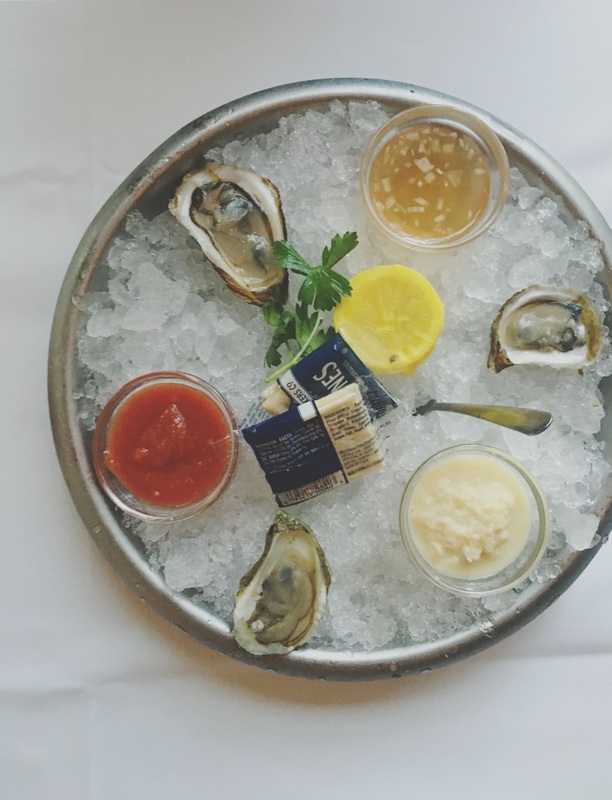 My mom went crazy over her oysters (while I clung to the Epi-Pen in my purse because, #shellfish), and I also enjoyed my appetizer. 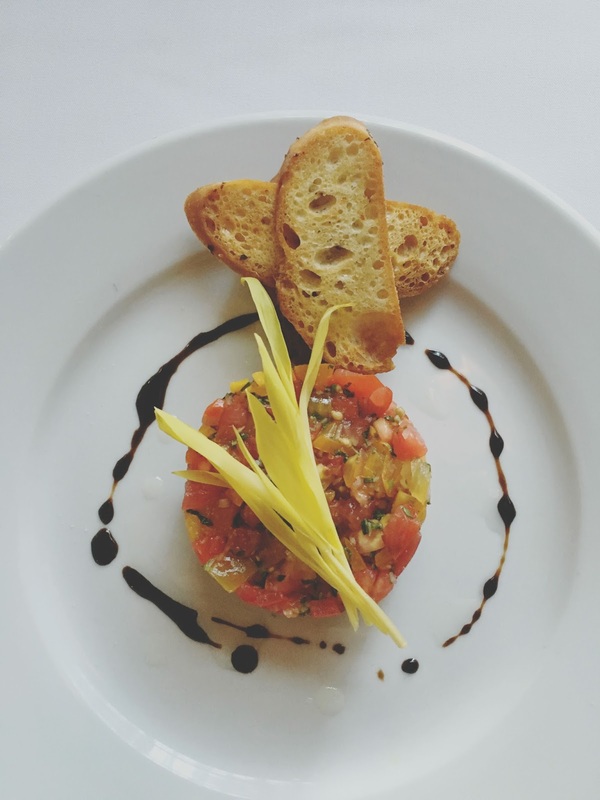 Served with crispy crostinis, a blend of vine ripe heirloom tomatoes was drizzled with balsamic vinegar and herbs. It was a bright, beautiful, flavorful, summery bruschetta, and I was all to pleased to gobble it up! Next up for food, we decided to split the Fuji apple salad. 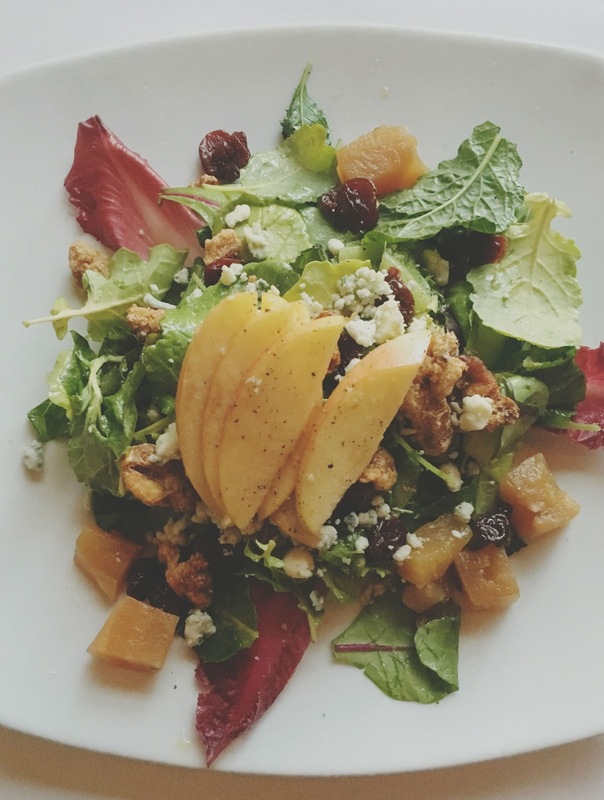 A bed of mixed greens was topped with subtly sweet golden beets, tart dried cherries, delightful candied walnuts, a light ginger orange vinaigrette, and just the right punch of blue cheese crumbles. I tend to go for savory salads, but this is one salad on the sweeter side that I was definitely into! All of the flavors came together in such a fun, simple, and pleasing way! After our salad, we ordered some drinks from the Sparkling Sounds of Summer menu - A glass of the Veuve Clicquot Yellow Label Brut Champagne for my mom, and the 24-Karat Cocktail for me. Mom's champagne was very dry but VERY smooth. It was definitely a solid bubbly choice! 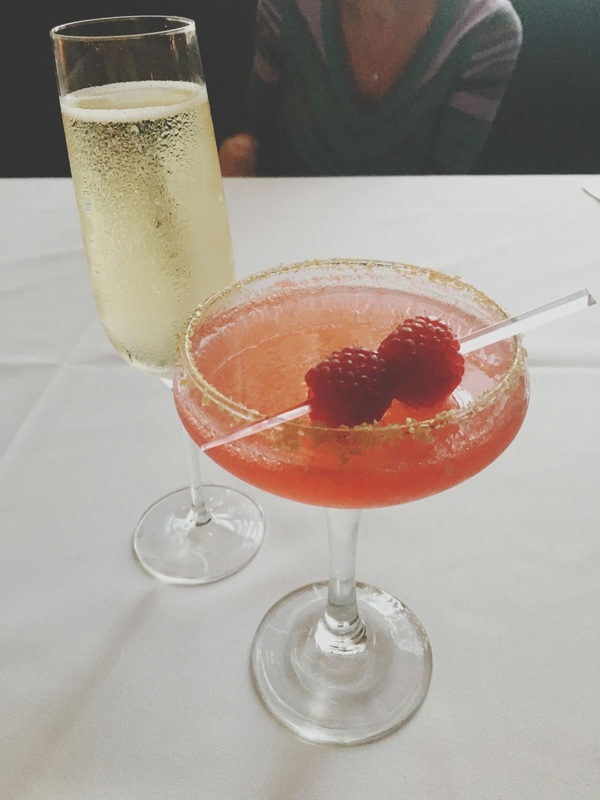 My cocktail contained Belvedere vodka (my favorite), Grand Marnier, raspberries, peach, and Ferrari Brut rosé, and was topped with a gold sugar rim. The sweet counterpart to my savory martini, this drink still managed to be light and refreshing. And how could you not love that gold sugar rim?! After that, we ordered a ton of food to try! 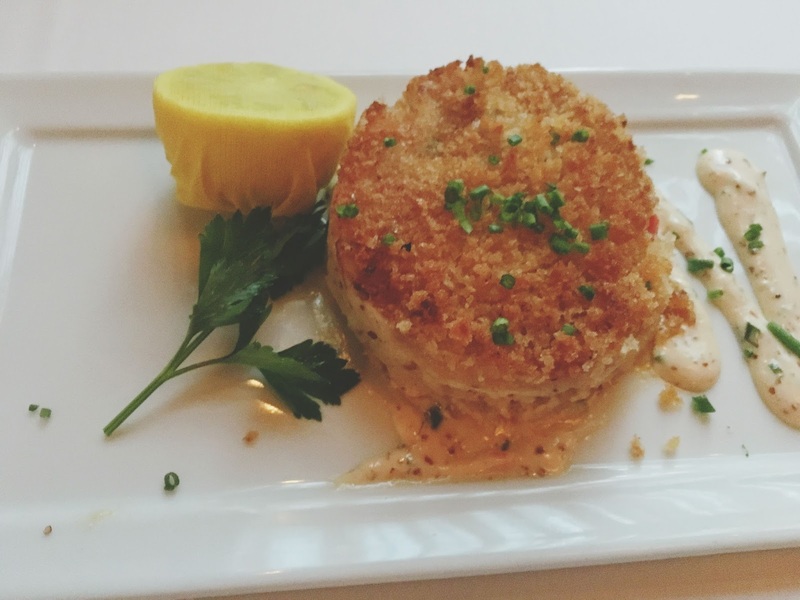 Starting with the jumbo lump crab cake for my mom, and the market vegetables for me. 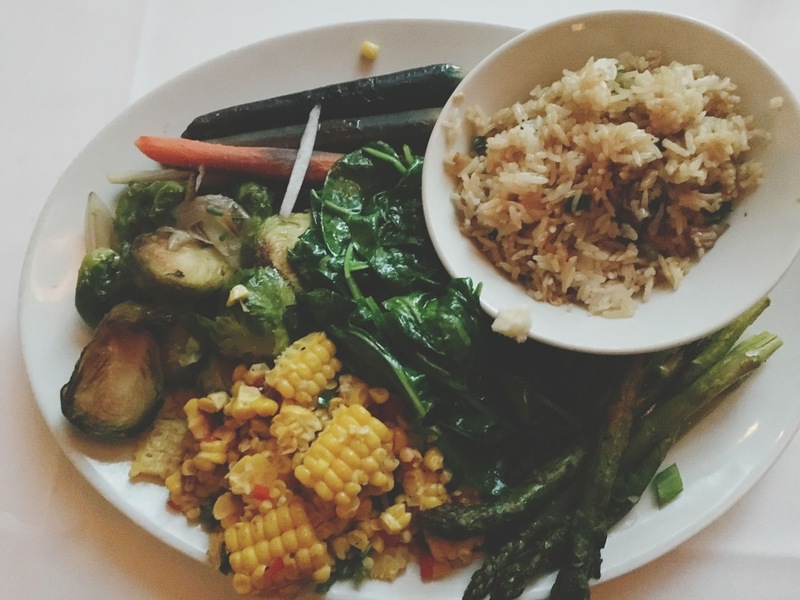 My mom loved her crab cake, and I loved diving into my vegetables. 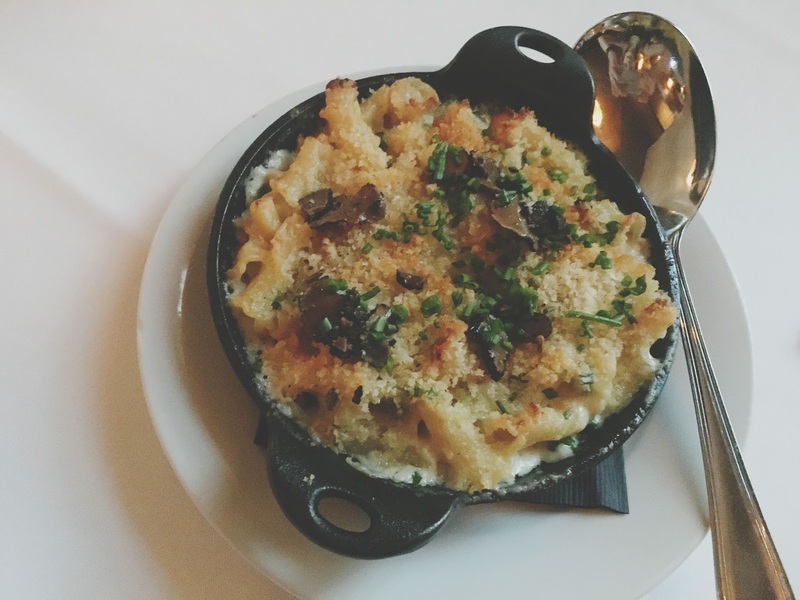 I'd tried this on my last visit and there were only a few changes (brussels sprouts and roasted carrots instead of roasted beets and sauteed mushrooms included in this week's version), so I won't go too into too many details to avoid repeating myself. 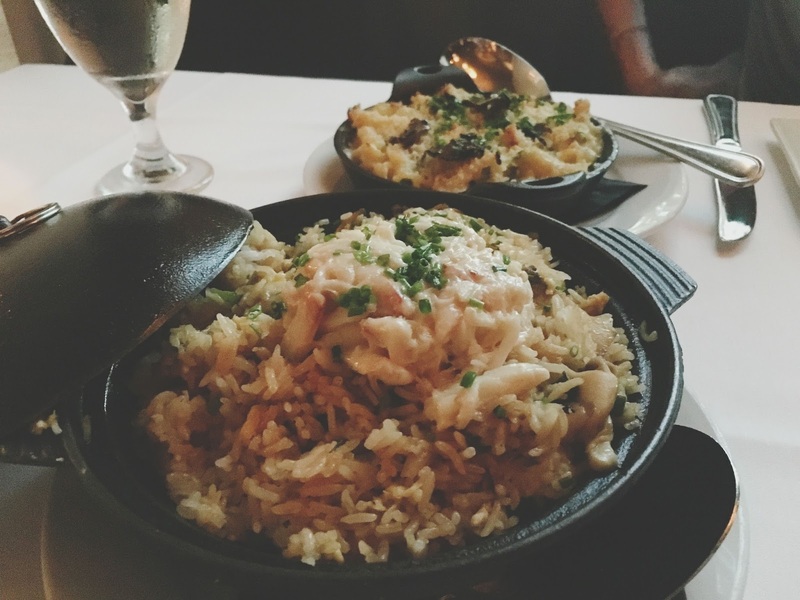 Just know that I LOVED it, and my favorite was absolutely the vegetable fried rice. Lordy was that awesome! 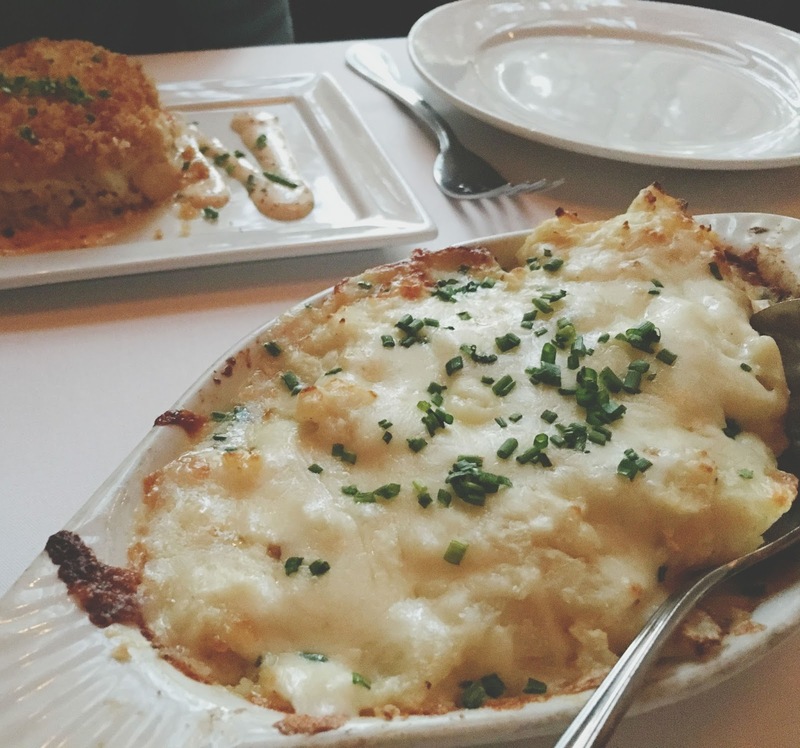 Then we ordered some more food from the Side Dishes portion of the menu - Crab fried rice, truffled macaroni and cheese, and au gratin potatoes. ...that is, until we ordered dessert. 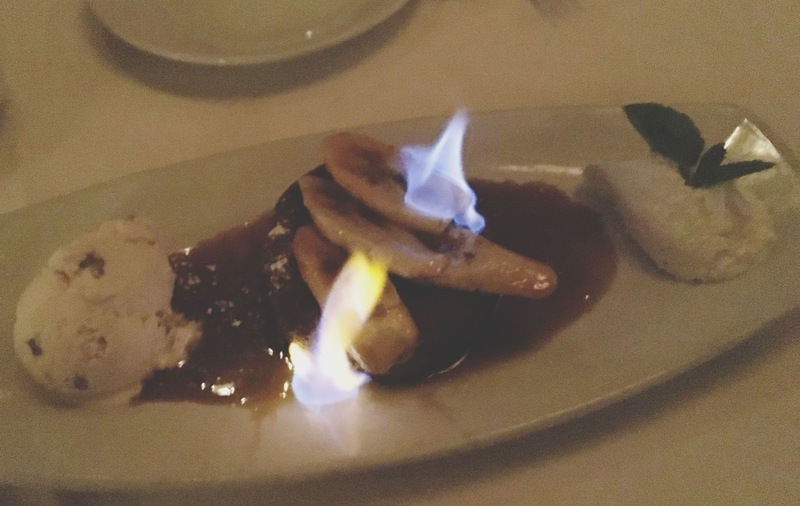 For dessert, we ordered the restaurant's hot "bananas foster" butter cake, which was served with a side of butter pecan ice cream and topped with what can only be described as liquid fire (I'm a person who is easily impressed by magic shows, FYI). This was, hands down, THE best bananas foster I have EVER had. The cake was wonderfully crispy, crumbly, and sponge-y; the caramel was thick, buttery, and dripping with magic; the butter pecan ice cream was nutty and not overly sweet, and the bananas were absolute heaven. We couldn't get enough! 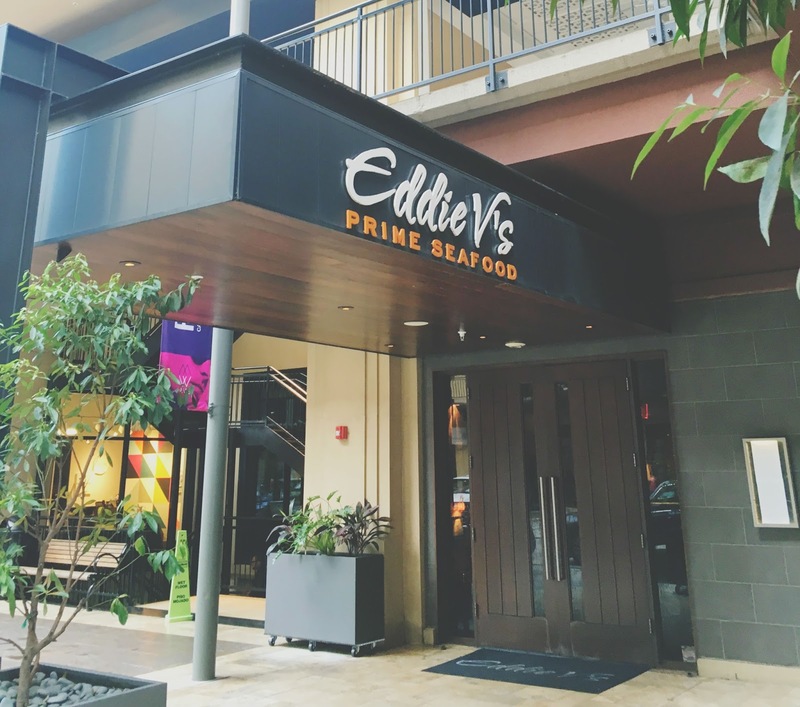 Hurry to Eddie V's in Houston's West Ave or City Centre area now so you don't miss the wonderful Sounds of Sparkling Summer event that ends this week. The music, food, drinks, and overall atmosphere in the restaurant's lounge area are beyond lovely. And the Eddie's Hours menu offers great deals on food and drinks as well. Or just go for a special night out, because you are sure to get just that! ^ So who's coming over for leftovers?